There have been 45 individuals sworn into office. John W. Geary, elected in 1850, was the first mayor of the city. Charles James Brenham, who served as mayor during the 1850s, is the only person who has served two non-consecutive terms. The mayor of San Francisco is elected every four years; elections take place one year before United States presidential elections on election day in November. Candidates must live and be registered to vote in San Francisco at the time of the election. The mayor is usually sworn in on the January 8 following the election. The next election for a full mayoral term will be in 2019. For the Native American and Mexican Mayors of San Francisco before statehood, see List of pre-statehood mayors of San Francisco. To date, 44 individuals have served as San Francisco Mayor. There have been 45 mayoralties due to Charles James Brenham's serving two non-consecutive terms: he is counted chronologically as both the second and fourth mayor. The longest term was that of James Rolph, who served over 18 years until his resignation to become the California governor. The length of his tenure as mayor was largely due to his popularity. During his term, San Francisco saw the expansion of its transit system, the construction of the Civic Center and the hosting of the World's Fair. The shortest term was that of Charles Boxton, who served only eight days before resigning from office. Three mayors have died in office: Otis died from illness, Moscone was assassinated, and Lee suffered a cardiac arrest. 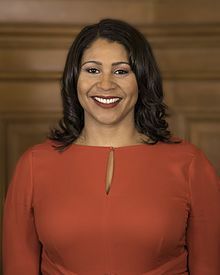 Dianne Feinstein and London Breed are the only women, Willie Brown and London Breed are the only African Americans, and Ed Lee is the only Asian American to have been elected Mayor. Thirteen mayors are native San Franciscans: Levi Richard Ellert, James D. Phelan, Eugene Schmitz, James Rolph, Elmer Robinson, John F. Shelley, Joseph Alioto, George Moscone, Dianne Feinstein, Frank Jordan, Gavin Newsom, Mark Farrell, and London Breed. Four mayors are foreign-born: Frank McCoppin and P. H. McCarthy ( United Kingdom of Great Britain and Ireland, present-day Republic of Ireland), Adolph Sutro ( Prussia, present-day Germany) and George Christopher ( Greece). This list does not include acting mayors, of which there have been many, as an acting mayor is typically appointed by the mayor whenever he or she will be out of the city. The following is a list of congressional, gubernatorial and other offices held by mayors, before or after their term(s). As of July 2018, six former San Francisco mayors are alive, the oldest being Dianne Feinstein (1978–1988; born 1933). 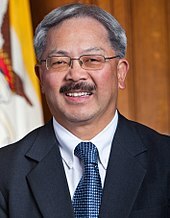 The most recent mayor to die is Ed Lee, on 12 December 2017 (while still in office). "San Francisco Mayors". City and County of San Francisco. Archived from the original on December 3, 2003. Retrieved September 3, 2009. "San Francisco Mayors". San Francisco Public Library. Retrieved March 11, 2009. "Agnos Is Mayor No. 39, Archivist Confirms". San Francisco Chronicle. Hearst Communications Inc. December 10, 1987. p. A 16. "City and County of San Francisco Municipal Code". City and County of San Francisco. 1996. Archived from the original on September 29, 2008. Retrieved March 11, 2009. ^ a b c "San Francisco Charter Code, EXECUTIVE BRANCH – OFFICE OF MAYOR § 3.101. TERM OF OFFICE". charter.sanfranciscocode.org. Archived from the original on February 15, 2016. Retrieved January 15, 2016. ^ Coy, Owen Cochran (1919). Guide to the County Archives of California. Sacramento, California: California Historical Survey Commission. p. 409. ^ "Rules dictate how SF's next mayor may be chosen and how long they may serve". San Francisco Chronicle. 12 December 2017. Retrieved 12 December 2017. ^ Fracassa, Dominic (June 13, 2018). "Mark Leno concedes SF mayor's race to London Breed". San Francisco Chronicle. Retrieved June 12, 2018. ^ Gordon, Rachel (August 21, 2003). "Judge denies instant election runoff". San Francisco Chronicle. Hearst Communications Inc. Archived from the original on January 13, 2006. Retrieved June 29, 2009. ^ Murphy, Dean E. (September 30, 2004). "New Runoff System in San Francisco Has the Rival Candidates Cooperating". The New York Times. Retrieved June 26, 2009. ^ Wildermuth, John (November 7, 2007). "Counting S.F. ballots will take a record amount of time". San Francisco Chronicle. Hearst Communications Inc. Archived from the original on June 4, 2011. Retrieved June 27, 2009. ^ a b Amy Graff, Here's what San Francisco's highest-paid workers make: 1 tops $500K salary, 9 make more than mayor, San Francisco Chronicle (July 11, 2017). ^ Riley McDermid, It's official: Ed Lee is America's highest-paid big city mayor, San Francisco Business Times (January 13, 2017). ^ Carl Nolte, Brown's Idea For S.F. 'Camp David' / Navy mansion catches his eye, San Francisco Chronicle (March 5, 1996). ^ Rick Hampson, Mayoral mansions have mixed track record, USA Today (December 11, 2013). ^ Starr, Kevin (1997). The Dream Endures: California Enters the 1940s. Oxford University Press US. pp. 115–117. ISBN 0-19-510079-4. ^ Nolte, Carl (April 25, 1999). "A Roaring Decade, A Glorious New City, A Rival to the South". San Francisco Chronicle. Hearst Communications Inc. Archived from the original on December 15, 2007. Retrieved July 3, 2009. ^ "Eugene E. Schmitz (1864–1928)". Virtual Museum of the City of San Francisco. Archived from the original on October 24, 2008. Retrieved March 13, 2009. ^ "Governors of Kansas". Kansas State Historical Society. Archived from the original on December 1, 2010. Retrieved December 1, 2010. ^ Cope, Michael (August 13, 2007). "Gettysburg unveils statue of Mt. Pleasant-native general". Pittsburgh Tribune-Review. Archived from the original on December 1, 2010. Retrieved July 14, 2009. ^ "Mayor's of Salem". City of Salem, Massachusetts. Archived from the original on December 1, 2010. Retrieved March 12, 2009. ^ Clarke, S.J. (1913). San Francisco: Its Builders, Past and Present : Pictorial and Biographical. Clarke (S.J.) Publishing Company. p. 118. ^ Shuck, Oscar Tully (1901). History of the Bench and Bar of California. The Lawbook Exchange, Ltd. pp. 551–552. ISBN 1-58477-706-0. ^ a b "Governors of California". State of California. Archived from the original on December 20, 2008. Retrieved March 12, 2009. ^ "California Governor Washington Bartlett". National Governors Association. Archived from the original on May 6, 2011. Retrieved June 18, 2009. ^ Hittell, Theodore Henry (1897). History of California. N.J. Stone & co. pp. 709–710. ^ "Phelan, James Duval, (1861–1930)". United States Congress. Retrieved March 12, 2009. ^ "Shelley, John Francis, (1905–1974)". United States Congress. Retrieved March 12, 2009. ^ a b Sward, Susan (November 26, 1998). "Moscone's Time Was Anything But Quiet". San Francisco Chronicle. Hearst Communications Inc. Archived from the original on January 22, 2011. Retrieved March 12, 2009. ^ "Feinstein, Dianne, (1933 – )". United States Congress. Retrieved March 12, 2009. ^ St. John, Kelly (June 7, 2001). "Mary C. Agnos – son was S.F. mayor". San Francisco Chronicle. Hearst Communications Inc. Archived from the original on July 25, 2001. Retrieved March 13, 2009. ^ Gordon, Rachel (May 31, 1995). "Agnos begs off Senate bid". San Francisco Chronicle. Hearst Communications Inc. Archived from the original on December 1, 2010. Retrieved March 13, 2009. ^ Gordon, Rachel (January 4, 2004). "The Mayor's Legacy: Willie Brown". San Francisco Chronicle. Hearst Communications Inc. Archived from the original on March 16, 2009. Retrieved March 13, 2009. ^ York, Anthony (November 3, 2010). "Gavin Newsom elected California lieutenant governor". Los Angeles Times. Retrieved November 3, 2010. ^ Wildermuth, John; Garofoli, Joe (January 8, 2019). "Gov. Gavin Newsom promises a 'progressive, principled' California - SFChronicle.com". www.sfchronicle.com. Retrieved January 20, 2019. ^ Egan, Ferol (1998). Last bonanza kings: the Bourns of San Francisco. University of Nevada Press. pp. 168–169. ISBN 0-87417-319-1. ^ Proceedings of the California Academy of Sciences. California Academy of Sciences. 1893. p. 365. ^ Bean, Walton (1952). Boss Ruef's San Francisco: the story of the Union Labor Party, big business, and the graft prosecution. University of California Press. pp. 227–230. ISBN 0-520-00094-3. ^ Nolte, Carl (November 6, 2007). "Exhibition spotlights career of 'totally forgotten mayor' Taylor". San Francisco Chronicle. Hearst Communications Inc. Archived from the original on December 1, 2010. Retrieved March 13, 2009. ^ "San Francisco Race Close" (PDF). The New York Times. November 5, 1931. Archived from the original (PDF) on July 17, 2011. Retrieved March 13, 2009. ^ Gordon, Rachel (November 26, 2008). "Feinstein recalls S.F. 's 'day of infamy'". San Francisco Chronicle. Hearst Communications Inc. Archived from the original on February 15, 2009. Retrieved March 14, 2009. ^ "Ed Lee becomes the city's first Chinese American mayor". San Francisco Chronicle. Hearst Communications Inc. January 11, 2011. Retrieved January 11, 2011. ^ "Ed Lee, San Francisco's First Asian-American Mayor, Dies at 65". The New York Times. December 12, 2017. Retrieved December 12, 2017. ^ "SF Board of Supervisors name Farrell interim mayor — Breed voted down". San Francisco Chronicle. January 23, 2018. Retrieved January 23, 2018.